Maruti Baleno 1.2 Zeta, the mid-range version is geared up to take on the likes of the Hyundai Elite i20, Honda Jazz, Volkswagen Polo and Fiat Punto Evo. This trim has a huge package of features, which include antilock braking system, electronic brake force distribution, driver seat belt reminder and dual front airbags. The passenger comfort is also taken care of with the likes of automatic air conditioning, central locking, front and rear seat adjustable headrests. Looks wise, it is stunning from inside as well as outside with aspects, such as alloy wheels, chrome finished door handles and a sleek front grille. However, its interior has metal inserted front footwell illumination, door handles and a parking brake lever. This model gets an impressive braking mechanism along disc and drum brakes affixed to its front and rear wheels, respectively. 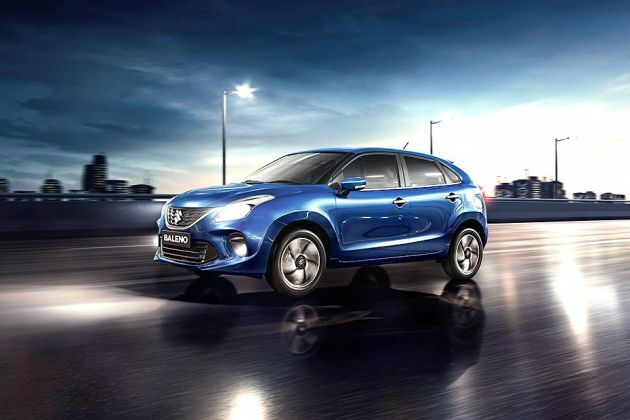 Mechanically, the Baleno is very efficacious in producing 115Nm through an 1198cc petrol engine that comes with a DOHC valve configuration and coupled to a 5-speed manual transmission. The manufacturer is offering 2 year or 40000 Kilometers (whichever is first) basic warranty. This can also be further increased by an extended warranty program. Find out what other variants of Maruti Maruti Baleno offer in terms of comfort and safety features. The Baleno is truly capable of getting customers' attention through its charming aesthetics, comprising of a chrome accented grille, a pair of aggressive headlights, black colored air dam with sophisticated front and rear fog lamps. Side door handles are adorned by chrome, while external mirrors with turn indicators and bumpers come in body color. Moreover, there are 16 inch alloy wheels, rear spoiler, tail lights along LED lights, A, B as well as C pillar blackouts. Notably, it has ultra violet cut glass for front and rear doors in order to protect the occupants from sunburn. On the other hand, this runabout has a minimum turning radius of 4.9 meters and a ground clearance of 180mm, which makes it compatible for any road condition. To start with, this variant has metal inserted door handles and parking brake. Apart from these, its glove box, boot compartment and front foot-well comes with illumination. The steering wheel is wrapped in leather and can be tilt adjusted, while its seats wear fabric upholstery. A multi information speedometer display is available with a digital odometer, showing the exact distance traveled by the car, tachometer and digital clock. Talking about entertainment section, this model has an integrated 2-DIN system, CD/MP3 player, FM/AM Radio, Bluetooth connectivity, USB and Aux-In along with well placed speakers. To take care of the storage requirements, it has cup and bottle holders, rear parcel shelf, a high volume glove box for keeping quite a few things in hand. Then, there are assist grips, floor mats and other such aspects that add to the overall look. It is powered by a 1.2-litre VVT petrol engine, which has a DOHC valve configuration with four cylinders. Mated to a 5-speed manual transmission, this mill is good enough in churning out power of 83.1bhp at 6000rpm and torque of 115Nm at 4000rpm. It has a fuel tank capacity of 37-litres and MPFI fuel supply system that enables the car to delver mileage of 17.8 Kmpl within the city. There is McPherson struts affixed to its front axle and torsion beam at the rear. Besides this, the front wheels are paired to discs, while rear ones have drum brakes. Anti-lock Braking System is also available for further improving its braking efficiency. The car maker has given a lot of comfy features to this newly launched hatchback as it gets central locking to lock and unlock the doors automatically, electronic foldable external mirrors, automatic AC, front and rear power windows. Apart from these, this version has remote keyless entry, telescopic steering, push start/stop with smart key, follow me home lights, front as well as rear power outlet. There is an automatic up and down functionality for the driver side power window. Its front and rear seat headrests have adjustment facility, while center armrest with storage comes for the front seats. Notably, the driver seat gets height balancing convenience and the steering wheel includes control buttons pertaining to the music system. It has a boot space of 339-litres that can further be enhanced by folding its rear seat. The Maruti Baleno incorporates almost all necessary features that can protect the passengers from any accident. It has an anti theft security system to prevent any kind of unauthorized entry, Suzuki TECT (Total Effective Control Technology) body, ABS, EBD front seat belt pretensioners as well as force limiters. There is a pair of airbags, dual horn, automatic headlights with leveling and auto dimming IRVM. This runabout includes reverse sensors, rear windscreen defogger, wiper and washer as well. 2. Fuel efficiency is good. 1. Interiors can be made better. 2. Luggage room is slightly lesser than other contender. Maruti Baleno is available in 6 different colours - Pearl Arctic White, Metallic Premium silver, Premium Autumn Orange, Pearl Phoenix Red, Metallic Magma Grey, Nexa Blue.